Description: B&M 330 + four other units sit at Rigby Yard as MEC 374 comes back from the west end. POED and a four unit switcher were also at the west end of the yard when this photo was taken. Description: AMTK 90213 - AMTK 16 are power for Downeaster Train 696 - as it passes through Rigby, passing WAPO which is just arriving at the yard at the same time. Power for WAPO: B&M 330 - B&M 334 - MEC 382 - MEC 370. MEC 382 was smoking up a storm and from this angle almost looked like the cabbage was smoking! Description: Seen at Rigby Yard. Description: PORU w/ B&M 330 - MEC 314 goes under the small footbridge in Falmouth Maine - next to Hannaford. Description: Very quiet day at the yard - but tons of power parked on the engine tracks. PORU is seen toward the right of the frame waiting to depart - with B&M 330 - MEC 314. Title: PORU 330 at Depot Rd. 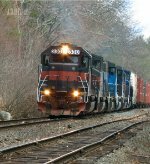 Description: PORU w/ B&M 330 - MEC 314 crossing Depot Road in Gray Maine. Description: PORU with BM 340 - MEC 511 - MEC 514 - BM 330 pulls hard up the grade at Read St. Title: WAPO 330 at Mill Rd. Description: WAPO with BM 330 - MEC 305 - MEC 517 - MEC 371 - MEC 348 rolls through Mill Rd. Description: With an LTEX leased unit. Description: PO-4 with BM 330 and three cars heads west through the marsh on a cloudless June evening. Description: DO-1 with BM 330 awaits its crew to take it west in Portsmouth NH at7:00am. Description: RUPO with BM 330 - MEC 380 - MEC 5953 awaits a crew at Blue Rock Rd.